Before my recent trip to Bohol, I only knew of Jagna as the location of the port in Bohol for boats from Camiguin and Cagayan de Oro (CDO). Now I have come to know Jagna as a place of beautiful beaches and mountains, and of course, delicious calamay made with lots of love. 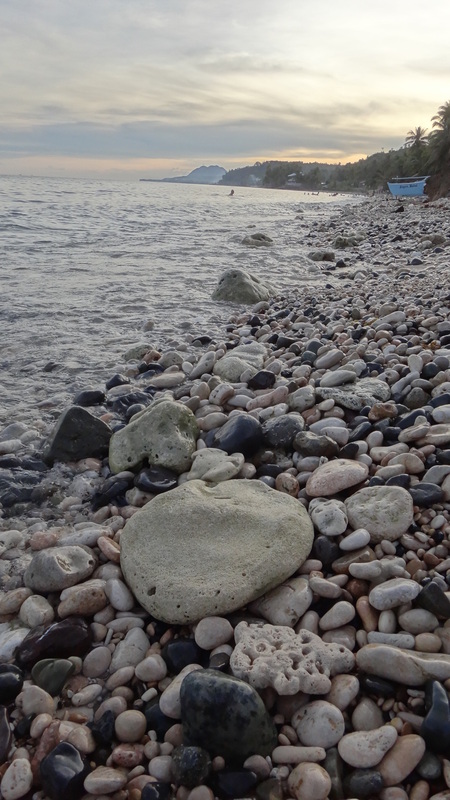 Just a five-minute tricycle ride from the Jagna market and port is Can-uba beach, a pebble beach with mostly white and gray stones. It is a public beach with free entrance – you only have to pay if you are renting a cottage. Of course, it can be quite noisy because many people hang out there, but my friends and I found out that by walking just a bit, we were able to find peace and quiet. 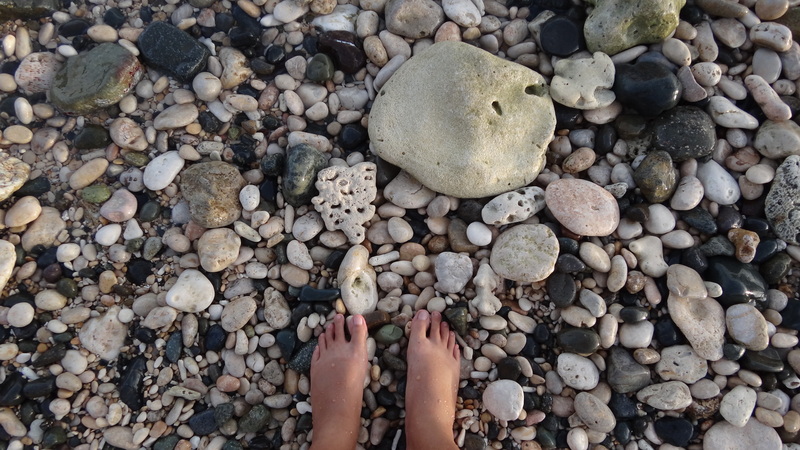 The pebbles in the beach felt smooth on my feet. They were no doubt shaped by the persistent rolling of the waves. 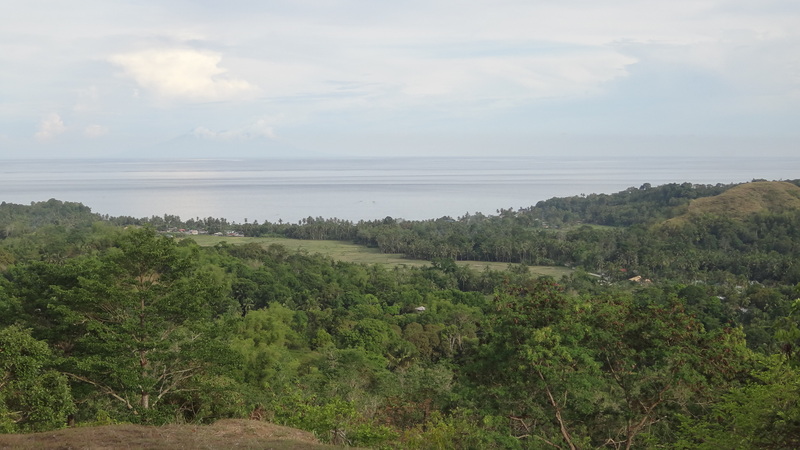 Off in the horizon is the blue mountainous outline of Camiguin, three hours away by fast craft. 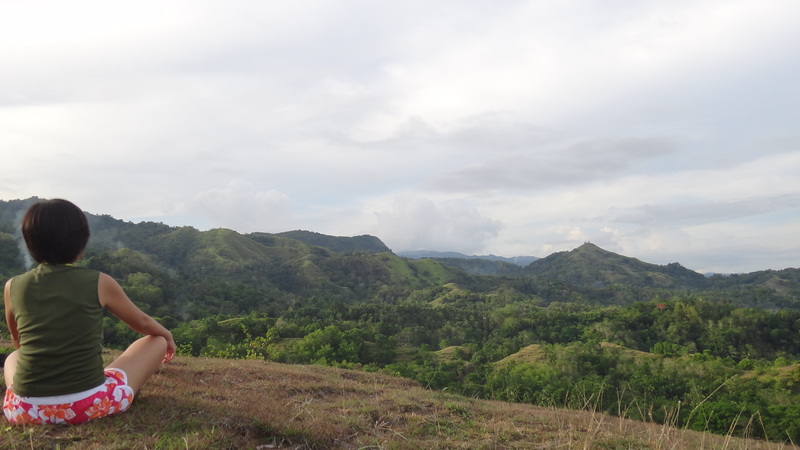 Another beautiful place worth going to in Jagna is the Cantuyoc mountain, one of some mountains in the area where you can have a view of the mountains, sea, and the nearby barangays of Jagna. 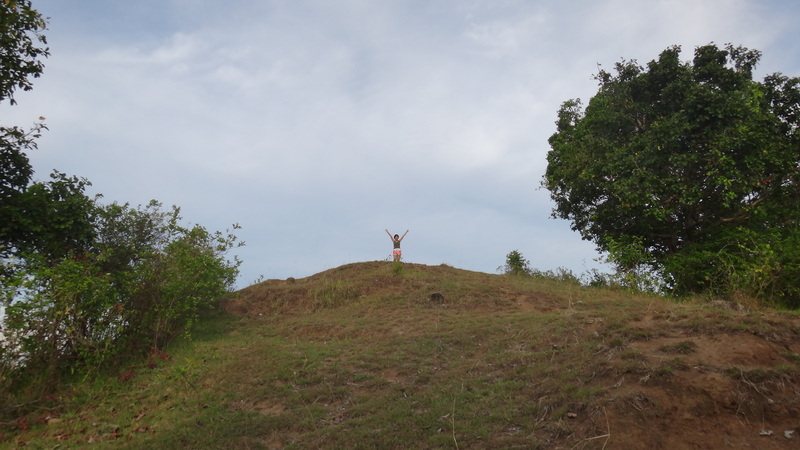 Our host graciously took us there by motorbike. Some parts of the ride were steep, but it took all of ten minutes from the Jagna market and port. The Cantuyoc summit is a grassland, beautifully standing out from the greenery of the trees and nearby mountains. I have also read about Kinahugan Falls, more than five kilometers from Jagna market. My friends and I were not able to go there, though, as we got caught up observing and helping out with the barangay fiesta preparations. Kinahugan Falls is also accessible via motorbike from the Jagna market and port. I found that the Jagna market and port area in itself are worth going to, if only for the delicious Jagna calamay. Calamay from different makers are displayed outside the port, all made with the same love and patience of stirring for more than two hours. 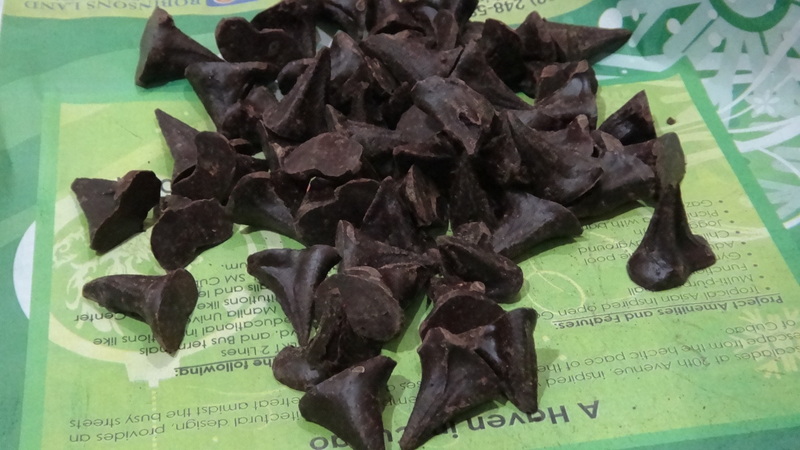 I also bought pure, 100 percent tablea shaped like kisses in the Jagna market. They sell at Php 1 apiece. Each of these kisses were lovingly shaped by hands and not poured into molds. 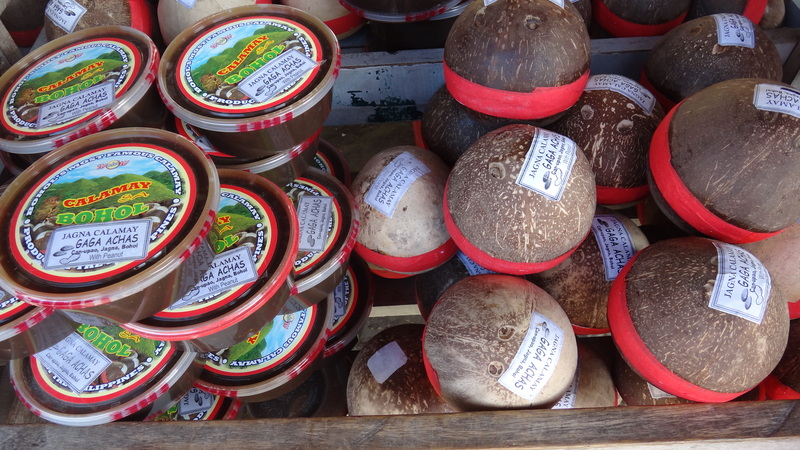 Some of the calamay sold at Jagna port. I saw how calamay is lovingly made. See the process here. I discovered that Bohol souvenir shirts outside the port sell at Php 130 or Php 140, a bit cheaper than the Php 150 price in the Tagbilaran central market. The prices at Jagna port are generally cheaper than those of the Tagbilaran market. While Jagna is not your usual Bohol tourist destination, it is definitely worth a visit, especially if you are riding the fast craft from CDO or Camiguin to Bohol. If you are taking the fast craft from Camiguin or CDO, you won’t miss it! If you are coming from Tagbilaran, take a bus or van from the Dao Terminal beside the Island City Mall. The ride is one hour by van. Take a tricycle from the Jagna market. Or, if you are riding the van from Tagbilaran, you can ask the driver to drop you off at Can-uba beach as its entrance is beside the main road. Take a motorbike from Jagna market. 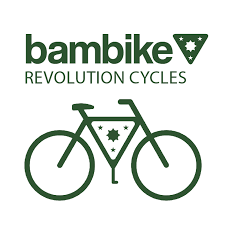 NOTE: For the motorbike and tricycle rides, haggle with the driver or compare prices with other drivers. My friends and I were supposed to pay around Php 20 each to ride to Can-uba beach, but when we asked another driver, he charged us Php 10 each. Do you remember if there was anyone was offering motorbike rentals? We would like to hire one at the port. Thanks in advance. I am not sure, but there probably is. Sorry, just saw this. Hope you have – or had – a great trip!